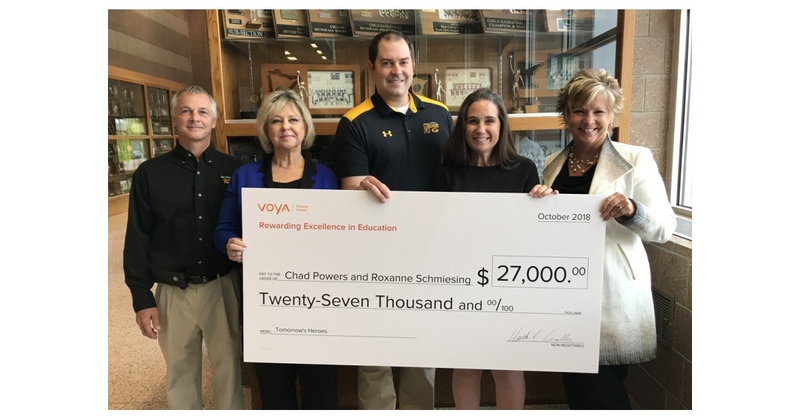 WINDSOR, Conn.–(BUSINESS WIRE)–Voya Financial, Inc. (NYSE: VOYA), a leading provider of retirement plans for educators, announced today that Chad Powers and Roxanne Schmiesing, two teachers at New London-Spicer High School in New London, Minnesota, have won the first-place grant award in the company’s annual Voya Unsung Heroes program. Through this effort, Voya awards $2,000 grants to 100 K-12 educators across the country each year to support their innovative and creative teaching ideas. Voya also selects three top winners to receive additional funds. In its 20-plus years, the program has awarded over $5 million in grants to roughly 2,000 educators across the U.S.
As the first-place winners, Powers and Schmiesing will receive $25,000 in addition to the $2,000 grant, bringing the total financial award to $27,000. This money will be used to help bring “Tomorrow’s Heroes” to life at New London-Spicer High School. Powers and Schmiesing’s innovative teaching idea, “Tomorrow’s Heroes,” focuses on creating an elective emergency medical technician (EMT) class for the students at New London-Spicer High School, along with CPR course offerings at the middle-school level. Students involved in the project will experience hands-on practice at volunteer or “paid-on-call” departments and will partake in certification tests to be registered as first responders. In addition to gaining medical and technical education experience, students will develop proficiencies in science, technology, engineering and math (STEM). This experience will provide students with an opportunity to serve their local community and beyond. With the Voya grant, Powers and Schmiesing plan to purchase necessary materials and equipment, including training aids, dummies and other materials needed to prepare students for situations they will face in emergency medicine. To learn more about this year’s winning projects, as well as those from previous years, visit the Unsung Heroes website at Voya.com/UnsungHeroes. Applications for the 2019 Voya Unsung Heroes awards are currently being accepted through the website until April 30, 2019. Voya Financial, Inc. (NYSE: VOYA), helps Americans plan, invest and protect their savings — to get ready to retire better. Serving the financial needs of approximately 14.3 million individual and institutional customers in the United States, Voya is a Fortune 500 company that had $8.6 billion in revenue in 2017. The company had $528 billion in total assets under management and administration as of June 30, 2018. With a clear mission to make a secure financial future possible — one person, one family, one institution at a time — Voya’s vision is to be America’s Retirement Company®. Certified as a “Great Place to Work” by the Great Place to Work® Institute, Voya is equally committed to conducting business in a way that is socially, environmentally, economically and ethically responsible. Voya has been recognized as one of the 2018 World’s Most Ethical Companies® by the Ethisphere Institute; one of the 2018 World’s Most Admired Companies by Fortune magazine; as a member of the Bloomberg Gender Equality Index; and as a “Best Place to Work for Disability Inclusion” on the Disability Equality Index by Disability:IN. For more information, visit voya.com. Follow Voya Financial on Facebook, LinkedIn and Twitter @Voya.